I don't know if you have experienced this but as I grow older, I begin to appreciate some of the dishes that my parents liked which we kids didn't. 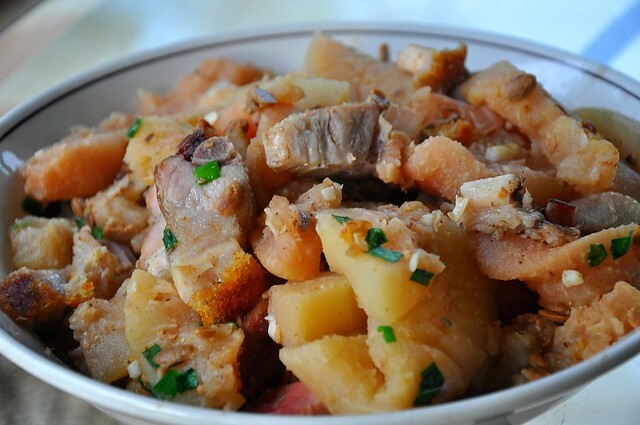 Stewed pomelo pith (the mesocarp) and roasted pork is one of them. This is not a common dish and I think it is Cantonese in origin. I think back in those days in China when people were very poor, they didn't waste food and the skin of the pomelo was not thrown to the pigs but used for cooking. I didn't find pomelo pith tasty because it was like a sponge, without much flavor except for the sauce that it was cooked in. Recently my mom cooked the dish and I was surprised to taste the subtle citrus flavor of the pith. I guess when you're a kid you can't appreciate such things. Not all pomelos (which is a giant grapefruit, as big as a human head or even a football) have a tasty pith. If you are lucky to get one with a strong citrus flavor, do try and cook this dish just so you know how it tastes. 1. Peel the skin off the pomelo. Cut off the rind and cut the pith into slices about 2 cm thick by 5 cm long. 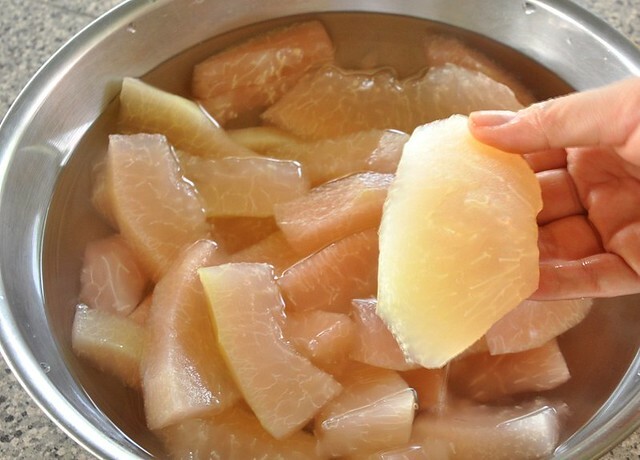 Amended prep method: Boil the pomelo pith until they turn transparent. Soak in room temp water, changing the water two to three times to remove any bitterness. 2. Heat up a heavy pot or a wok. Add the oil and fry the garlic and bean paste until fragrant. Lightly squeeze the water out from the pomelo pith and place into the pot/wok. Add the pork, stirring well to mix. Add about 3 T light soy sauce, stir, then add the stock and cover. Simmer about 5 to 10 minutes. Season to taste with more light soy sauce if needed. Add more stock if necessary. The dish should be quite soupy because when left to sit, the pomelo pith'll soak up the liquid. Garnish with the spring onions. Oh!! This is something new. I didnt know that pomelo pith can be eaten. Hmmm... I am wondering if I can substitute the roasted pork with chicken since I dont eat pork. Yummy, I have to try this one. shaz: can you eat the jackfruit seed?? i thought it's the cempedak and tarap seeds tt are edible. food: oh yes you can. we actually end up digging for the pith, leaving the meat behind. pvdela: oh wow, thank you:)! The pomelo here in Hawaii is very sweet, and we eat it just like an orange. Known here by a couple other names beside pomelo - jabong or boo look. I like Pomelo! I can find it here in Prato (my city), but never thought to use it in this way!!! ...you're always so full of ideas! I would like to understand the way you eat: when I go in a Chinese restaurant I never know the proper way I should eat the food: if I have to dip in the sauce, or pour it on the food...if I should eat it with chopsticks or spoons...can you explain it in your posts, please?? It should seems granted for you, but not for me!! Habits are so different, and I would like to be "polite", and not "rude" with Chinese people here in my city!! Thank you. Greetings to Yi! I've had this dish in HK and it was amazing. Thanks for sharing. My family is original from a Toi Shan village in Canton, China. All the old folks know how to prepare braised pomelo skins with oyster sauce. I have been searching for a decade on how to prepare it. All the ones who know how to do it passed away one by one. I long for it and even bought a couple Chinese pomelo trees. Thank you so much, especially the preparation part.